Our approach ensures that the collaboration among Contractor, Design Team and Owner offers effective controls. We’ve sculpted a full range of services to aid our clients during the pre-construction phase through building completion. These services include; project planning and design, estimating, scheduling, quality and safety management, and contract administration. As you’ll find, JFA Construction LLC processes are detailed and delivered within budget and on-time. It’s important to understand every client is unique and our processes change with those individual needs. We look forward to an initial meeting with you to tailor our services to the needs of your project and overall goals. Overall project success relies heavily upon the decisions made at the initial stages of the job. Our pre-construction services go well beyond traditional cost estimating and value engineering to create more reliable schedules and estimates. 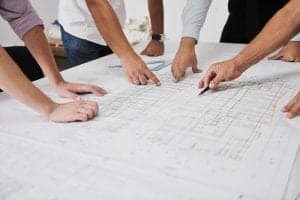 We get the right people involved at the appropriate time, to drive down project costs while maintaining design intent, schedule, budget, materials and the customer’s overall goals and objectives. The most important building details are developed long before construction begins on a facility. Having a construction manager on board early can make a huge difference in the success of a project. A collaborative team can help you make the necessary decisions. Our team is built of professionals who work with our clients to prepare and implement a seamless transition of their existing operations and the activation of their new facilities on the first day of occupancy. Our approach to project planning eliminates operational down time and reduces your risk of lost revenue.